In case you haven't figured it out by now, I'm a bit of a slacker to say the least. Between posting here far too infrequently and so many other ways I procrastinate my way through life, I'm not sure how I get anything done. Here's an example that will be worth your time in the end. I heard The Civil Wars on NPR (A Prairie Home Companion, if you must know) earlier in the year and was very impressed. I made a note to pick up their album Barton Hollow, which was released in February, and promptly did nothing more about it. This week as I was going back through the albums I loved this year I realized I needed to finally grab a copy and see if their studio work held up. Damn, it certainly does. The Civil Wars is a duet comprised of Joy Williams and John Paul White. They make something like dark folk music with incredibly woven harmonies, but there's a distinctly Southern feel mixed in. At times it reminds me a lot of Damien Rice's duets or something from the soundtrack of the movie "Once." That's a glowing review. 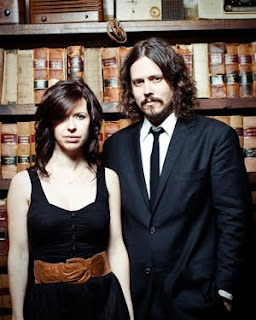 There's actually been a lot of hype about The Civil Wars, from their first big exposure as a featured song on "Gray's Anatomy" to touring with Adele to being hailed as the future of music. I usually don't get behind the hype machine but I think these guys do deserve it if anyone does. Here's "Poison & Wine," the song that more or less gave them their big break. So I'll admit it's long overdue, but at least I'm finally getting more word out about this group. Pick up a copy of Barton Hollow and see what they're about if you haven't already. And while I'm playing a bit of catch-up, let me throw a couple other recent albums that are worth the listen: Undun by The Roots is touted as a concept album but it's just a good album overall, regardless of whether you pay attention to the themes or not. El Camino by The Black Keys is not as strong as last year's amazing release, Brothers, but it's still a great blues-rock record. The Dreamer, The Believer by Common is making a lot of folks throw that "album of the year" phrase around. I can never fault someone who lovingly samples ELO, but take a listen and decide for yourself. And have a merry Christmas or whatever you may celebrate.